Today during his class at the honbu, Nagato sensei kept repeating that everything he was doing was 簡単 kantan (easy, simple). He repeated it many times during training. But watching the many practitioners in the honbu I got the impression that these “easy and simple” techniques were quite difficult to reproduce for those of us who were not used to Nagato sensei’s taijutsu. It reminded me of Kary Mullis (Nobel prize of Chemistry 1993)*, who said in his book “Dancing naked in the mind field” that to make things look simple, it is very difficult. This simplicity we are striving to get is the result of a long and difficult process. 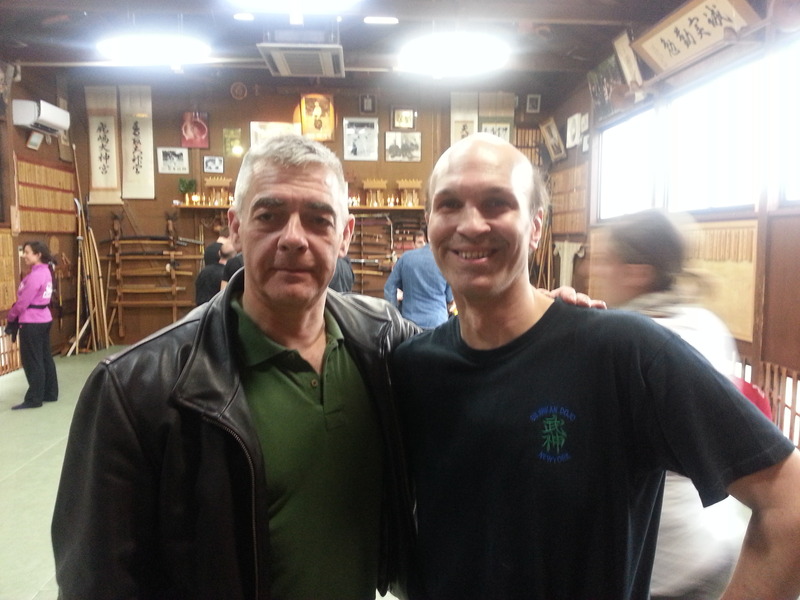 During the break I was exchanging on that subject with my friend Joe Maurantonio and we finally agreed that this “simplicity” in sensei’s budô was indeed the real secret to be found in the Bujinkan. And we also agreed that only those who could develop the proper vision could see it. It reminded me of a discussion I had in the 90s with Mark Lithgow after a dinner we had with Sôke in Noda. Mark said something that I will always remember: “Sensei is not teaching 体術 taijutsu (body techniques) but 目術, mejutsu, (the art of seeing reality). The magic about Hatsumi sensei’s philosophy of budô and that it is so simple and obvious that very few students are able to understand it. Speaking about that we agreed, Joe and I that sensei’s vision had had a strong impact on the way we developed our lives as adults. The real secret about Sôke’s ninjutsu is that there is no secret when you finally understand. Everything is hidden in plain sight! But it takes many years to discover that and not everyone will find it. Joe told me that it reminded him of some sentences of “Ninpô: Wisdom of life”** one of the first book written by Sôke translated into English. With Joe’s permission (he is the publisher of the book) I reproduce here a few sentences taken from this great book on Life and budô that each Bujinkan practitioner should have in his library. When you develop the “eyes of the heart” nothing is complex anymore, as you are in symbiosis with nature. Today was another great day for learning. Thank you Nagato sensei’s, thank you Sensei. The book “Ninpo – Wisdom of Life” is quite small in size, but with a huuuge content. I hardly ever succeeded to read more than one chapter in a time. Thanks to Joe it’s available for us not speeking Japanese. A must have for everyone!